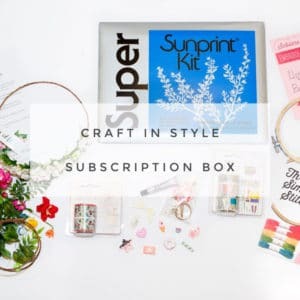 Make something special each month with the Craft in Style Subscription Box. With this box, you will receive cool and stylish monthly diy projects delivered to your door. All boxes include multiple projects and are beginner friendly and full of modern, stylish, and Pinterest worthy. Pop Shop America creates cool craft kits that include all the supplies you need. You don’t have to shop at a million different stores. These kits are easy to follow so you can skip Pinterest fails and go straight to crafting in style! We are looking for 5-10 bloggers to receive our monthly Subscription Box that is filled with stylish craft supplies. Each subscription will allow you to make multiple projects per month. We are looking for unboxings, Youtube videos, blogs, and social. A combination of these things based on what makes sense for you. We are hoping for long term relationships. We are searching for DIY & Craft Bloggers & Subscription Box Bloggers. Food & Beverage or Home that would like to try something different could be perfect! Any lifestyle blogs with female readers that are between 25-40 years old. Participants also receive free goods. For bloggers with a wide reach, there are some stipends available. We welcome bloggers that we have previously worked with or those that have applied previously to apply again!